It used to be 6 ogors, 4 ironguts, 4 leadbelchers. But by modern standards of start collecting boxes, that’s too much, especially if you add in a character. I think an equivalent to other start collecting armies out there would be: 6 ogors, a butcher, and then either an ironblaster or 3 leadbelchers. I think you can only do 2,2,2. It says “a third of... can be armed with one of ...” rather than with any of. Most of the time, you’re better off with multiples anyway. Gotcha. I originally read it as 2 lots of stormfiends, with you now. Let us know how you get on! In my experience, stormfiends are great in PtG, as are aboms Are you using battletome tables? In which case an arch warlock gives you 4 picks, whereas 2 stormfiends and 1 wlc are 2 each ( so 6 in total). Sound plan. For the extra 80 pts, I’d ally in 4 frost sabres, I think; or a gorger if you want to stay pure Gutbusters. 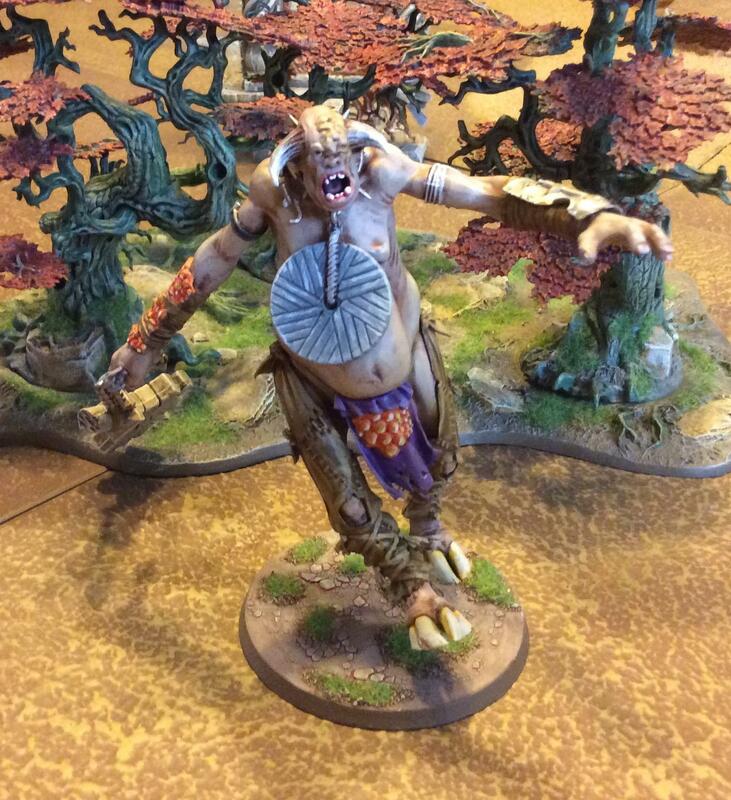 If you find you lack magic, you could always swap out one unit of ironguts instead, and add a butcher plus 3 ogors. Ogors aren’t as hard hitting, but can still deal with non-armoured targets, especially on the charge, and the butcher buffs can help all. You essentially have to do averages of averages. If you roll a 1, you will average (well, you will get!) 6 mortal wounds. If you roll a 6, you will average 1 mw (I.e. you will roll one 6 in 6 dice on average). There are way more than 6 outcomes, but 6 average outcomes corresponding with the first d6 roll. That’s why the average is 3.5, but also why you have a higher probability of high or low damage. (E.g. the probability of getting max output of 6 mw is 1 in 6 - not bad odds. If you mmwl, the odds of max 12 mw is still 1 in 6 because of the peculiarity of the way damage is calculated. The chance of 0 mws is different.) MAX output is however 12 mw in one turn, which I didn’t adjust above! Grrr, give me back hit and wound rolls! So 12 in one turn, 24 over 2 turns while it destroys itself. Compared to 12 (vs 4+ Sv) in one turn for 4 max power jezzails, 18 over 2 turns, while they destroy themselves too. Hmm, I think I have confused the damage characteristic of the melee attack on the wlc when doing the calculation. You’re right, in that you can’t spark the mw of the cannon (I made the assumption correctly when calculating the jezzails, in that a natural 6 would only cause 2 mw, not 2+1). In which case halve the numbers for the wlc after the initial calculation, and you have: unbuffed: 3.5 mmwl: 7, but suffers average of 4 wounds a turn over 2 turns, 14 mw destroying itself. max output 28 wounds a turn, 56 over 2 turns. That does look more sensible, good catch! so the wlc is better when overpowered than jezzails with full buffs, but they will kill themselves quickly. Interestingly, that changes the position when jezzails are just sparked, in that 4 sparked jezzails will do around 6 wounds against save 4+, whereas unbuffed wlc will do 3.5 on average. The deviation is different, in that a wlc will be more likely to do more and less. The choice I think comes down to how prepared you are to overcharge and burn your own units down. Burst damage, the wlc is still better over 2 turns, but sustained, the jezzails are probably better. The gryph-feather charm is great on a thunderhusk, as it stacks with chill. I would also consider charngar’s pelt from BCR, as coupled with the (self) healing ability of the thunderhusk you can heal your ‘tusk for an average of 2.5 wounds a turn; which can really help keep those mortal wound snowballs coming thick and fast, especially if your opponent has some plink attacks to chip away at his damage table, rather than a full on gunline. Doppelgänger cloak has been errata’d to be once per game, so less useful. Rabid Crown is absolutely the way to go, turns a Master Moulder into a locus of buffs! Well it would certainly be fun to try! As you surmise, it wouldn’t play the objective game well, and you are a bit vulnerable to hordes with multiple attacks, but then you are playing BCR in the first place!